From the Iowa Policy Project. Our 6th edition of The Cost of Living in Iowa finds that roughly 100,000 Iowa working households are unable to make basic needs. Put another way, about 17 percent — or 1 in 6 — households cannot get by on their income alone. It is a critical number that should inform countless public policy discussions for the remainder of 2018 and on into the next legislative session. These pieces provide the foundation for Part Three, which is forthcoming and will connect the dots to further illustrate the importance of public work support programs for many Iowans, who despite their work efforts, are not able to pay for the most basic living expenses. Part Two uses census data to estimate the number of Iowa working households that are able to meet the basic needs without public assistance. In 2018 we find that 17 percent of households or 227,000 Iowans live below this threshold. Broken down further, fully 62 percent of single-parent working households are unable to meet basic needs. For this family type, there is an average gap of $20,000 between after-tax income and basic needs expenses. 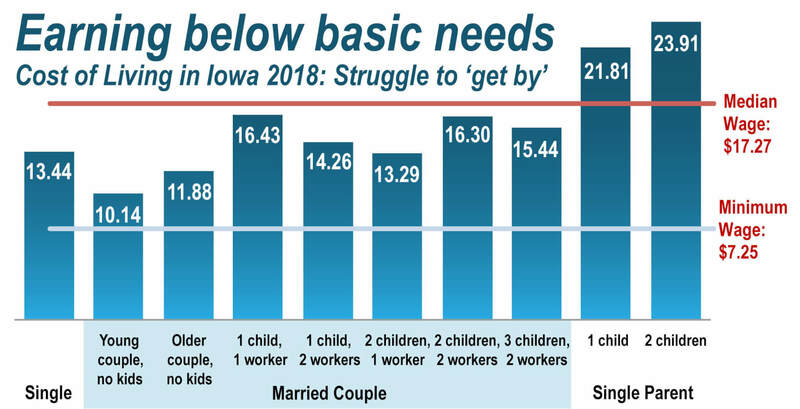 A larger share of African American (30 percent), Hispanic (28 percent), and female-headed (19 percent) households are unable to meet basic needs in Iowa. NEXT POST Next post: Where Are The 2020 Women At? Governing, Mostly. 1. It seems really counterintuitive that, in your text example, a one worker/one child married family would need a LOWER wage ($13.29) than the same family with TWO workers ($16.30) Child care, it seems would not explain why the two-worker family would require more than double the wage of a one-child family. I think that your numbers in the body of this article do not match the graph. That same $16.30 ($16.43?) is assigned to the married, one child, one worker, and the $13.29 is assigned to two children, one worker. The one child, two workers category is, on the graph, assigned $14.26. And again there is the problem (I don’t know; even if it IS counterintuitive, maybe it is accurate) that a one worker, two child family requires a smaller wage than the one worker, one child family. That aside, this is worry-making, and it’s only going to get worse while the current administration hold the reins of power in this state. Thanks for this, Ms Veldhouse. I’ll have to read and digest the three part report for a full understanding . However at face value of what is written in this article I would say that raising the minimum wage to at least fifteen dollars would markedly reduce the number of people needing any kind of assistance if not needing it at all . This would decrease the cost for the state agencies providing assistance shifting the responsibility to employers instead of the general public subsidizing the employers and their employees, period !!!!!!!! !